aromatherapy in your home. A few drops of essential oils can deliver therapeutic aromatherapy throughout the area while clearing the air and creating an amazing fragrant environment. So, why don't you invest in essential oil diffuser today and enjoy the benefits of a happy, relaxing and healthy environment? Make use of less oil: Diffusers that use heat burn through oils very quickly to spread the same amount of scent into your air. When using an essential oil diffuser, you only use a fraction of oil to get the same fragrance effect. Boost the immune system: If you have a strong immune system, then you are less likely to get ill. When you inhale essential oils, they go directly to the lungs. There they are quickly captivated into the bloodstream and circulated all over the body within a few minutes. On a daily basis, diffusing immune supportive essential oils improves your immune system. Used as natural perfumes: Essential oils not only smell good, but improve concentration and uplift mood. A nourishing atmosphere of harmony and peace can be created, by diffusing essential oils. You can also spray this on laundered clothes or on your pillows. Anti-stress and emotional support: No more stress! Essential oils help manage with high moments of stress. Take some amount and rub it softly behind the ears and nape of neck. You can also add it into a relaxing massage that allows you to enjoy its amazing calming vapors. Such smells can reduce blood pressure and slow heart rate. Used for spa and relaxation: You can also use it as spa that helps refresh the mind and body, maintain and promote psychological, physical and spiritual well-being. It is an incomparable sensual experience that regain confidence and self-esteem most especially for women. You can use essentialoils diffusers in the home, health spas, hotels, hospitals, offices and even cars. Nowadays more people are going back to nature as an alternative way of health problems and healing diseases. 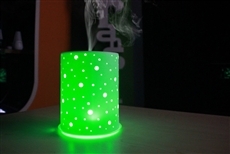 So relax your fatigue body and mind with this exclusive and safe essential oil diffuser.